The TLX isn't perfect, but we think we could change that. The old Acura TL was a very good car, especially in Type S trim or with the latter 3.7-liter V6 with SH-AWD and optional six-speed manual transmission. Acura replaced the TL (and the TSX) with the new TLX, and we don't think that the new car has captured the magic of its predecessor. 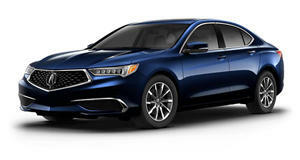 Acura has been in a rut for a few years now, but based one what the company revealed at Detroit, we think that this slump may be ending soon. The TLX has the potential to be a great car, and we have five changes that we think would make it perfect. We've argued that bringing back Type S models would be a great way to improve the brand. Acura has concurred, announcing that it will finally bring back Type S models with an all-new engine. The most powerful TLX model uses a 3.5-liter V6 with 290 hp. The new Type S models will utilize a twin-turbo V6 that will be exclusive to the Acura brand. Not much else is known about this new V6, but we'd love to see around 400 hp to make it competitive with Infiniti's twin-turbo V6. Acura needs a performance model to show that the NSX is still related to other models in some way. Type S models won't just improve the TLX, but the entire Acura brand. Along with a Type S model, we would love for Acura to offer the TLX with a manual transmission. The TLX is currently offered with an eight-speed dual-clutch on four-cylinder models and a nine-speed automatic on V6 models. Even though we love manuals, we are firm believers that not every car on the market would be better with a stick shift. The TLX is not one of these cars. Acura and Honda build some of the best manual transmissions on the market, and we would love to see the TLX offered with one. The Honda Accord is still offered with a manual, but Acura no longer has any manual transmissions in its lineup. We'd like to see that changed. While we eagerly await the arrival of new Type S models, the sportiest TLX available is the A Spec trim. Unfortunately, the A Spec only adds more aggressive styling, bigger wheels, and some interior upgrades. The A Spec package only costs $2,900, but it is far from a real performance model. Acura has plans to offer more A Spec models that will sit between standard and high performance Type S models. We'd like to see Acura ape what Lexus does with its F Sport models and give the A Spec models suspension and handling upgrades that offer some performance improvements over the standard cars. We aren't too fond of Acura's current infotainment system, which combines two display screens. The system is a bit cumbersome to use, but luckily Acura has an improvement at the ready. Acura revealed a prototype version of the RDX SUV at Detroit, which showed off an all-new infotainment system. This system replaces the second touchscreen with a Lexus Enform-style touch pad. We assume that this new interior will eventually trickle down to the TLX, which will be a nice improvement. Our final change would be the introduction of a coupe variant of the TLX. Acura hasn't had a two-door model since the old CL and RSX went out of production. We think that a TLX Coupe could plug the gap in the market left when Honda discontinued the Accord Coupe. An Acura coupe would have likely eaten into Accord Coupe sales, which would no longer be an issue. We'd recommend reviving the old CL name and aligning it to the current lineup by calling this new model the CLX.